The flaming process turns the wood from a light brownish purple to a deep purple color. Except for a handful of vegetables, flowers, and minerals, purple is one of the scarcest colors found on the planet. 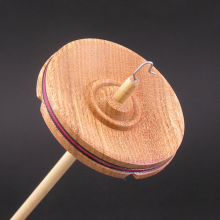 For that reason, it is no wonder that Purpleheart is very popular with spinners for drop spindle whorls. Unfortunately, it does change color over time when exposed to air and UV rays. When I first cut and turn Purpleheart, it changes to a brownish gray. 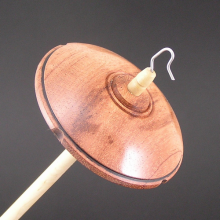 After turning, the whorl was flame treated which turns it into a very deep purple color. 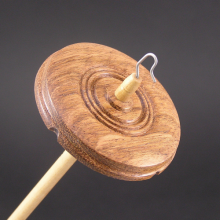 Any Purpleheart spindle should be kept out of direct sunlight or it will eventually turn a dark brown with just a purple tint. Purpleheart is currently imported from central and south America. 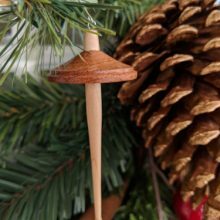 Purpleheart trees grow from 100′ to 170′ tall, with trunk diameters up to 4′. 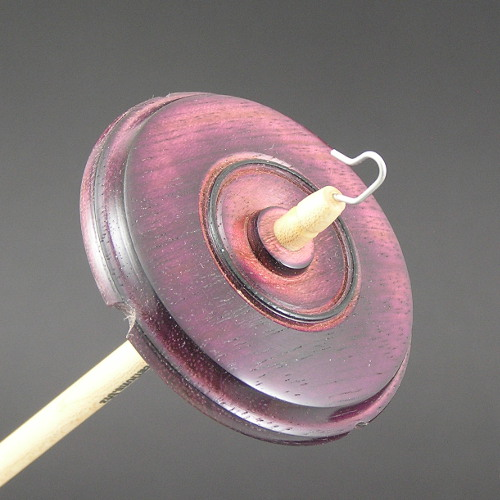 Be the first to review “Drop Spindle – Purpleheart #710 – Mini” Click here to cancel reply.